We’ve all read about it, all the fit celebrities claim they lose weight by eating raw (plus working out 6 days a week with a trainer and having someone prepare all their food!) so I decided to give it a try. 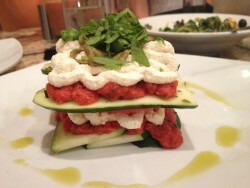 There’s a raw/vegan/gluten free restaurant in Winter Park called Cafe 118 Degrees. I figured it would be an experience, and wasn’t sure if I would like it or not, but decided to give it a try. I was absolutely blown away at how good everything tasted! We started with a curried cashew salad, on a bed of field greens with cashews and blueberries. SO delicious! For an entree I went for the lasagna, made with thin sliced zucchini, stacked with ricotta “cheese” which was really a light fluffy cashew paste, a sun dried tomato sauce, pistachio pesto and fresh basil. It was divine, and really did taste like traditional lasagna, thanks to the amazing home made sauce. I make my own pasta sauce from fresh tomatoes, so I know when it’s real, and this one was absolutely real. My kids and I are all gluten free – not by choice, out of necessity. My daughter breaks out in hives when she gets wheat, so we rarely go out. It’s nice to go somewhere and be able to order anything on the menu (except their pad thai has soy sauce in it so avoid that if you’re GF), and the deserts were all fine for us too. I highly recommend the s’mores. All their ice creams are made from home made almond milk, and are so smooth and creamy you would never know it’s diary free. We’ll be going back for sure, if just for the desserts. Give it a try if you’re looking to expand your culinary horizons. Just be careful if you have nut allergies as it seemed like every dish had some sort of nut ingredient. Don’t know if I could go entirely raw forever, it would be a lot of work and time in the kitchen. Maybe when I’m rich and famous I can hire a chef – but for now it’s just fun to try something new.